Dan Thomas discusses how Liverpool's stern defence is effecting the mentality of opposition teams coming to Anfield. It’s unfortunate that the clean sheet run we’ve had at Anfield has come to an end. It was a horrendous goal scored by a (with all due respect) horrendous team. Had Virgil van Dijk not stuck his foot out, it would have been an easy clearance but unfortunately, the ball swerved into the path of Callum Paterson, who beat Alisson to the loose ball. The last player to breach our defence at Anfield in the Premier League was Michail Antonio on the 24thFebruary. The West Ham man scored a consolation goal on the hour mark as the away team went down 4-1. And since then, we have been inpenetrable. If I’m being honest, we haven’t played a great deal of quality in that time apart from Manchester City earlier this month in a game where both teams cancelled each other out. But then again, that’s the point. Our record against the better teams in the league isn’t what costs us normally – it’s silly points dropped against those in mid-table or lower. And that is exactly why going on such a long run without conceding has been so important. It has sent a message – a message that Liverpool mean business. It has been a big part of underlining the fact that Liverpool are no longer an easy pushover. The days of teams coming to Anfield rubbing their hands at the prospect of an easy goal have long gone and teams now turn up to simply not get a hammering. 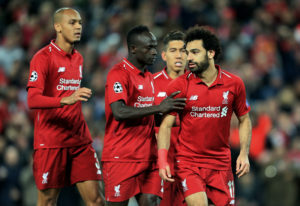 Mo Salah, Sadio Mané and Roberto Firmino (with Fabinho, below) have been nowhere near their blistering best and still teams have just defended without any attempt to score. In seasons past, this loss of form would have cost us points. One of the ingredients to Manchester City’s highly successful recipe is the psychology of having most teams beaten before they turn up. The prospect of chasing shadows for ninety minutes is enough to make most teams write the game off and focus on the next match and as such, City have a huge mental advantage before a ball has even been kicked. Opposition teams use City games as a training match against a much, much better team. Sounds familiar, doesn’t it? One team doing all the attacking and the opposition just defending with little or no intention to attack. It is this case more or less every game that we play at the moment. We currently have the same situation at Anfield – Cardiff manager Neil Warnock openly admitted that his team were up against a “virtually impossible” task by getting anything and he was proven to be right, for once. I don’t like Mrs Doubtfire one bit but he was very complimentary and respectful to us all week to the extent I’m suspicious, given that he has had nothing but run ins with us all of his career. With us steadfastly refusing to concede goals at Anfield, we have gone on such a good run at home and this has been integral to our excellent start to the season. Only City have left Anfield with a point so far this term, everyone else has fallen. By being so hard to score against, we have been able to overcome the fact that our front three have been way off the pace although they are showing signs of being back in business since the international break. What we now need to do is go on another run without conceding at home for as long as we can. Our next visitors at Anfield are Fulham, but then three of our next four home games are Everton, Manchester United and Saturday’s opposition, Arsenal. Keeping clean sheets in these games will be key to maintaining our excellent form at home, and if we continue to keep it tight at the back we will be in with a fantastic shout of winning every match at Anfield, because we have enough ball to cause damage.